Rushern Baker | Help Change The World. The Future Of The County Is Now. 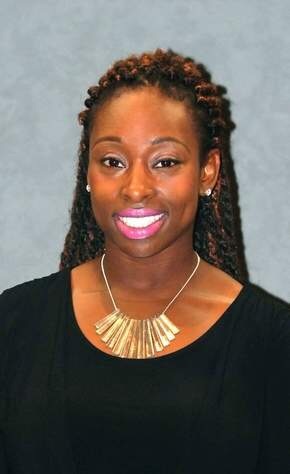 What’s next for Prince George’s County after school board member indicted? WASHINGTON — Her resignation wasn’t a surprise — but her indictment came as a shock. Prince George’s County Board of Education member Lynnette Mundey had announced in June that she was leaving the board, stepping down, she told the Sentinel newspapers, to get her doctorate in education. But this week, Mundey, an employee at the Government Accountability Office, was indicted, accused of gaming the school system she was appointed to serve. The Prince George’s County State’s Attorney’s Office announced she and four other GAO workers — all parents of children in the PGCPS school system, were charged with falsifying documents so that their children could qualify for the free and reduced meals offered for children in need in the school system. As a result of changes to the school board structure enacted after Baker was elected, the county executive has the power to appoint three school board members. Mundey holds an elected seat, but according to school board officials, her resignation allows the county executive the opportunity to appoint her successor to fill the remainder of her term. The Board of Education met in executive session at 8 p.m. Wednesday. Maryland law allows public bodies like school boards, town and county councils to meet behind closed doors in “executive session” under a number of circumstances, including personnel issues and when obtaining legal advice. 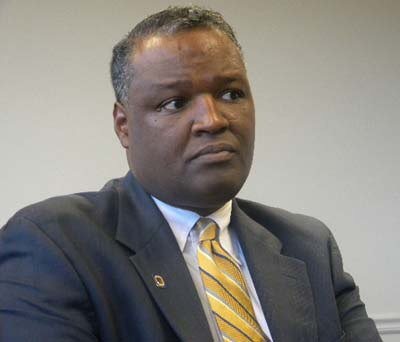 According to WUSA9, Prince George’s County Executive Rushern Baker met privately late Monday afternoon with community leaders from Fort Washington to explain his side of an embarrassing budget situation that has produced a new $14 million dollar county police station with no funding for the officers to occupy it upon completion. The meeting was held at the county administration building in Upper Marlboro, according to Baker spokesman Scott Peterson. Early in 2015, Baker proposed a budget that called for countywide furloughs of county workers and layoffs for some, while leaving enough money to staff the new District VII police station now near completion on Fort Washington Road. The Prince George’s County Council rejected that proposal and instead called for a 2 percent cut to all departments countywide. That left police with insufficient funds for the station, according to chief Mark Magaw. Baker vetoed the budget, but the council overrode him. Meanwhile, crime in the area of the District VII station has been declining, according to Peterson. 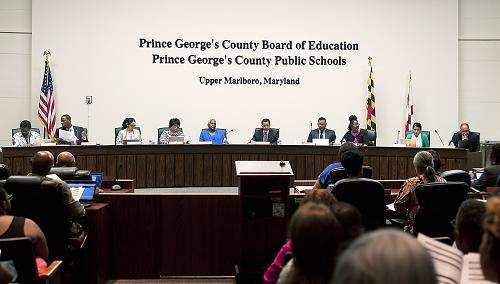 The situation is part of the fallout over a bitter year in Prince George’s between the County Executive and the County Council, which rejected Baker’s bold plan to raise taxes 15 percent to fund a turnaround of the school system. County Council Chairman Mel Franklin said delaying the opening of the station is “disrespectful” to those communities that had lobbied for it for 15 years and were eager to see it open in September 2015. “There was zero communication with the community,” said Franklin (D-Upper Marlboro), whose district would have been served by the station. The budget finally adopted by the council raised taxes 4 percent despite the cuts that were made. >>> Read more Prince George’s built a police station, but says it can’t afford to open it. 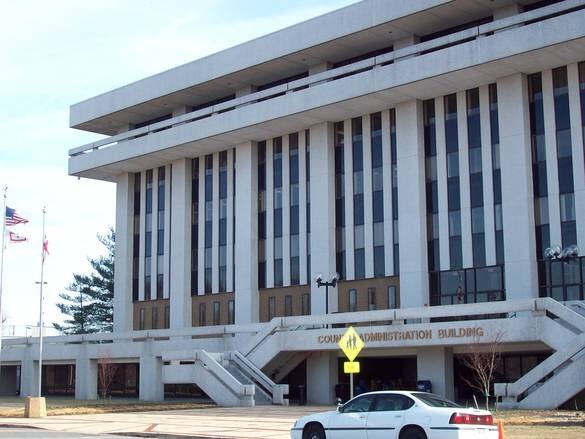 Prince George’s County Seat Could Be Moving to Largo. Details are still being worked out, but the possible move has some folks wondering about the future of the county seat, which has been in Upper Marlboro since its founding in 1696. 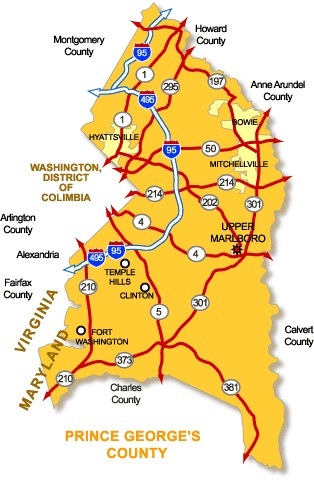 But Upper Marlboro is considered somewhat remote and hard to get to, which is why the county government has slowly moved to Largo since County Executive Rushern Baker took office. 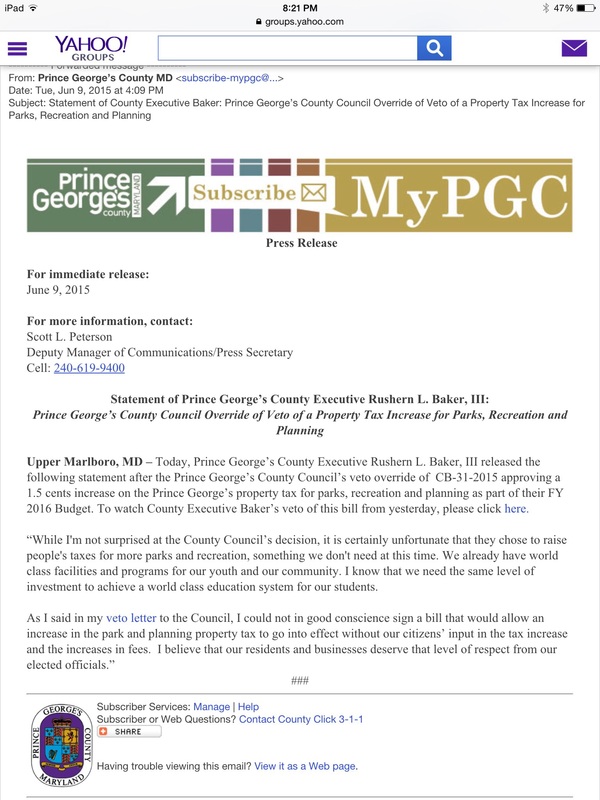 Kudos to the Prince George’s County Council for the recent reaction and veto concerning tax hikes advanced by the Prince George’s County Executive Rushern Baker III. However, on Monday June 15th, 2015, Mr. Rushern L. Baker III announced that he will veto parts of the budget approved by the County Council, restoring most of the tax increases that lawmakers rejected and setting up a possible legal showdown between the two branches of government. The County Council approved tax increase that would benefit the Maryland National Capital Park & Planning Commission and teacher retirement system which was meant to help stop the fiasco to some degree. While the parks system is valuable, priorities should dictate that additional revenue go to county schools which has no accountability mechanism to the determent of the county citizenry. According to Mr. Baker, the county schools need much more resources. Mr. Baker repeated an assertion made by his aides last week that the council acted illegally when it cut much of his proposed 15-cent property tax hike. While Baker’s rationale for the veto makes sense to some degree, his criticism of the council’s actions spotlights concerns that exist in his own office, as well. According to some county parents who did not want to be identified for fear of retaliation, they stated that the county ranks in the top five in the nation on per capita spending on school children. The funding is already more than adequate. In any case, money is not the problem and raising taxes to hire more administrators, relatives, and politically-connected contractors is not going to improve school performance. Mr. Baker and the council needs to focus on the money being wasted at Sasscer Administrative Building in Upper Marlboro. Dr. Kevin Maxwell either needs to be reigned in to do the right thing or resign his position. In any event, in a letter to council Chairman Mel Franklin (See attached below), Baker explains that the council did not “sufficiently inform the public” about the increase. Franklin says the budget meeting was open to the public and a video of the meeting was online, but Baker is right. The council should have made a more significant effort to alert residents about plans to raise the tax and sought their input. It’s the same criticism Baker faced when he decided to overhaul the school board in 2013 with a personal motive, only a few weeks left in the legislative session and little opportunity for input from residents. Sufficient time must be allotted for community involvement in such important decisions, whether they are made by the council or the county executive. Baker’s letter also mentions that the council’s lack of public engagement prevented discussions on the “propriety of such an increase.” He mentions that the council didn’t extend the “same courtesy” he provided to residents by hosting community forums as he sought to increase property taxes by 15.6 percent. What Baker fails to mention, however, is that the increase he was seeking was a slap in the face to county residents who felt blindsided by his proposal. The county has a decades-old, voter-imposed tax cap that Baker circumvented using a fairly recent state law that allows him to override county rules if the tax hike benefits schools. The county tax cap did not apply to M-NCPPC’s funding. So while it’s wonderful that Baker took a community approach to his proposed tax hike, many questioned the “propriety” and “courtesy” of his efforts, as well. Additionally, if a County Council cannot alter/amend a budget submitted by the county executive who is on his last term, we do not live in a democracy! The County Council needs to play it’s rightful role and put Mr. Baker on the spotlight instead of the other way around. The only thing that appears clear in this whole taxing mess is that county leaders clearly aren’t on the same page regarding priorities, and both branches need to work harder to ensure taxpayers — those footing the bill for such major decisions — become a critical part of the process on a consistent basis. Prince George’s County Council led Mr. Mel Franklin must do the right thing and Keep the County Executive in proper Check. “There are known knowns; there are things we know that we know. There are known unknowns; that is to say, there are things we now know that we don’t know. But there are also unknown unknowns – there are things we do not know we don’t know” – Donald Henry Rumsfeld, US Diplomat. Prince George’s County Council vote unanimously to override Baker’s veto. Prince George’s County council overrode Baker’s veto with a 9-0 vote. As a result of new corruption involving Baker, his aides et al, the county is falling behind. FORT WASHINGTON – The Prince George’s County Council and County Executive Rushern Baker III are at odds again after the Council voted unanimously to override Baker’s veto of the adopted Maryland-National Capital Park and Planning (M-NCPPC) budget. Last week the County Council adopted a budget slashing Baker’s proposal to raise taxes by 15 percent to fund $133 million in additional funds for the county school system, instead voting to raise taxes by only 4 percent. However, the council also approved a budget for M-NCPPC that includes a 1.5 percent property tax increase. Baker, who did not propose a tax increase in the M-NCPPC budget, vetoed the council’s budget but the council overrode it with a 9-0 vote. The planning department faces a structural deficit, Council Chairman Mel Franklin said, with expenses exceeding revenue on an annual basis. The department originally asked the county to increase property taxes by three cents, he said, but the council cut the proposal in half. Cutting funding for M-NCPP this year would mean a loss of 20 percent of funding to summer youth programs, reducing hours of operation by 10 percent to 30 percent at community centers and other public facilities, according to an impact study conducted by M-NCPPC. Baker said the county needs to emphasize providing better school facilities for children, not parks and planning departments. “I have to tell you that I am appalled by the council’s decision to increase the property tax rate by five percent on citizens in Prince George’s County. This was an increase that was never discussed during any of our meetings over the last month,” Baker said. The county has increased taxes to fund M-NCPP 13 times since 1978, Baker said, and another increase did not need to happen this year. “It is not strategic or visionary. And it is not an unfunded mandate from the state,” Baker said. Franklin disagreed with Baker, saying the tax is necessary because if it is not imposed this year, it must be imposed in the future and the cost will be greater because of the county’s structural deficit. Lehman, who voted against the council’s overall budget last week, voted to support the override of Baker’s veto because the council needs to be unified in their approach to fixing the county’s deficits. The council needs to work with M-NCPP, Lehman said, to reduce the project charges that have gotten out of control. Franklin said there may be a lapse of communication between Baker and his staff causing the disagreements. Baker had staff present during some of the public sessions where the council discussed the planning tax, Franklin said. Instead of continuing to raise taxes to aid M-NCPP and other county operations, Judy Robinson, a community activist and retired M-NCPP secretary, said, the county should look to cut expenses and reduce spending. The citizens asked for no tax increases, Robinson said, even if they were minimal and did not go toward education. Citizens still are not going to be happy with the smaller tax increases and having their money go to M-NCPP. No decisions on the overall budget have been made, Baker said. According to Thomas Himler, deputy chief administrative officer in Baker’s office, the executive has until June 16 to make any other decisions.